Next Generation: Solomon Islands After RAMSI is an exhibition depicting daily life in Honiara at the end of the Australian led Regional Assistance Mission to Solomon Islands (RAMSI). After fourteen years of peacebuilding, this young nation now looks forward to its future with optimism and a sense of renewal. The Department of Foreign Affairs and Trade commissioned Sean Davey to photograph in Honiara from June – July 2017 to mark the drawdown of the mission and to produce a series of documentary photographs that reveal the state of the country at this pivotal moment in its history. Rebuilding a Nation in Partnership: Regional Assistance Mission to Solomon Islands (RAMSI) 2003 - 2017 is an exhibition on permanent displayed at the National Museum of Solomon Islands. 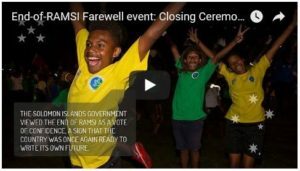 The exhibition opened during the end-of-RAMSI celebrations in Honiara on 29 June 2017. RAMSI: A History in Pictures is a photo exhibition charting the history of the Regional Assistance Mission to Solomon Islands (RAMSI). 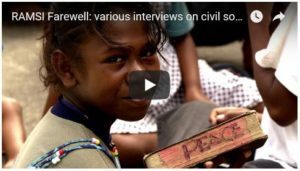 Featuring over 2000 photos from the Solomon Islands, including during the country’s civil conflict known locally as ‘the Tensions’, the arrival of over 5,000 police, military and civilians to the country in 2003, and the subsequent progress that has been made in Solomon Islands since. This legislation was passed by the Solomon Islands National Parliament on 17 July 2003. It gives the legal authority under Solomon Islands domestic law for all of RAMSI’s activites. The Activities Report is a joint RAMSI-Solomon Islands Government document outlining the work of the Mission over the previous year. It is presented to the Pacific Islands Forum as part of the Mission’s reporting to contributing countries. The Aid Program Performance Report summarises the Australian Aid Program’s development assistance in Solomon Islands delivered through RAMSI and the progress made over the reporting period. The Annual Program Performance Report summarises the Australian Aid Program’s development assistance in Solomon Islands delivered through RAMSI and the progress made over the reporting period. A collection of presentations from the seminar held to mark the 10th anniversary of RAMSI. This book examines where Solomon Islands has come from, and where the nation is headed over the years ahead. It deals with a whole range of topics, from mining and land issues to leadership and empowering women. 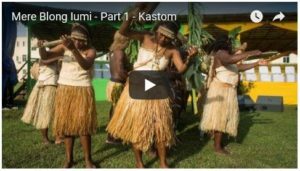 Put together to mark the 10th anniversary of RAMSI, ‘Rebuilding a Nation’ examines what RAMSI has achieved in Solomon Islands. The book is a tribute to the Government and people of Solomon Islands and to all those people who have worked as civilians, soldiers and police officers for the Mission. Solomons Pijin is the national language of Solomon Islands. Closely related to Tok Pisin in Papua New Guinea and Bislama in Vanuatu, it is used throughout the country’s nine provinces. In order to provide RAMSI staff, and the wider community, with a useful guide to using Pijin, RAMSI has produced Tok Pijin: A Quick Guide to Speaking Pijin. It is focused on everyday words and phrases, and includes a section on cultural and social etiquette.